This will be our 4th year at the capitol of Oregon, the birthplace of Veterans 1st. We are Veterans 1st Oregon State. We are Americans. Our Veterans in Oregon have very little help from our state government. With a governor clearly god-like in her own mind and a legislature with no backbone to stand up against her, We The People will rise and stand to protect the way of life of our Protectors, our Veterans. 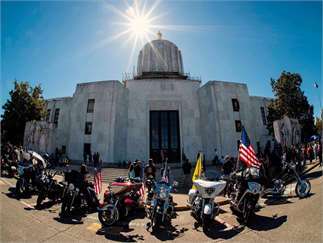 Once a year, we ride, bike, drive, walk to our capitol building to stand as one to remind our government who is in charge. Please join us once again as Americans, from all over Oregon, gather in unity to support and call attention to our Veteran's plight. This rally is open to ANY American willing to stand. Ride rally points and times will be posted as the rally draws near. You do NOT need to ride a motorcycle to attend in support. You do NOT need to be a Veteran to attend in support.